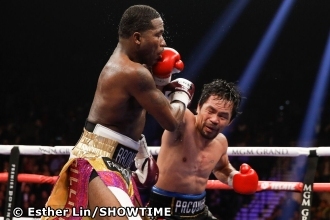 International matchmaker Sean Gibbons said yesterday if WBA welterweight champion Sen. Manny Pacquiao didn’t finish strong in the so-called “championship” rounds of his title defense against Adrien Broner in Las Vegas over a week ago, the fight could’ve ended in a majority draw. As it turned out, Pacquiao swept the last two rounds in the scorecards of Cheatham and Feldman. Moretti scored the 11th for Broner and 12th for Pacquiao. So in the final tally, Cheatham and Feldman had it 116-112 for Pacquiao or eight rounds for the defending champion and four for the challenger. Moretti saw it 117-111 or nine rounds for Pacquiao and three for Broner. What bothered Gibbons was Mora’s reputation to tolerate shenanigans in the ring. Sure enough, Broner got away with some butting, holding and elbowing. Although Broner escaped stern warning from Mora, he never gained from the tolerance. Pacquiao dominated the action with his speed and power. In the 12th round, Broner ran away to end the fight on his feet and went on survival mode to connect only one of 12 punches thrown in the final three minutes. The fight reestablished Pacquiao as a box office attraction in Las Vegas. Live attendance of 13,025 was a sell-out and pay-per-view hits will likely settle at 425,000----a bigger number than the 300,000 that the Deontay Wilder-Tyson Fury world heavyweight title fight in Los Angeles last December pulled in. It had been two years since Pacquiao last fought in Las Vegas and fans came out in droves to witness his first fight at 40. Several Filipinos living in different parts of the US took the trip to Las Vegas to show their support for Pacquiao. Now, the fans are clamoring for Pacquiao to meet Floyd Mayweather, Jr. once more in a rematch to settle who’s the superior fighter with the Filipino no longer hampered by a shoulder injury.